Anyone alive in the eighteenth century would have known that "the longitude problem" was the thorniest scientific dilemma of the day—and had been for centuries. Lacking the ability to measure their longitude, sailors throughout the great ages of exploration had been literally lost at sea as soon as they lost sight of land. Thousands of lives, and the increasing fortunes of Anyone alive in the eighteenth century would have known that "the longitude problem" was the thorniest scientific dilemma of the day—and had been for centuries. Lacking the ability to measure their longitude, sailors throughout the great ages of exploration had been literally lost at sea as soon as they lost sight of land. Thousands of lives, and the increasing fortunes of nations, hung on a resolution. To ask other readers questions about Longitude, please sign up. I loved this book! Has anyone else read it? Nathan Yes, it is non-fiction. Pretty much everything in the book is based on researched facts and records. It is a very goo read. I first read Longitude, by Dava Sobel, just after I finished high school, and I devoured it in a sitting or two. It was the first non-fiction book, I think, that I really couldn't put down. The (true) story is great: legendary historical figures like Isaac Newton, Galileo, James Cook, King George III; scientific conundrums; innovative engineering; a ransom of millions at stake; and a humble, lone man competing against oppressive and manipulative big-wigs. Background: Latitude lines are the parall I first read Longitude, by Dava Sobel, just after I finished high school, and I devoured it in a sitting or two. It was the first non-fiction book, I think, that I really couldn't put down. Background: Latitude lines are the parallel lines that circle the globe above and below the equator, and any sailor could figure out his latitude by measuring the length of the day or looking at the angle of the sun or the north star. But finding one's longitude, the lines that connected the north and south poles, was much more difficult. Anyone could determine that he was on the tropic of cancer, but determining how far along the tropic of cancer was a different challenge--one that, if solved, would revolutionize navigation and save countless lives. In 1714, Parliament offered a purse worth 20,000 Pounds (millions today) to anyone who could solve the longitude problem. John Harrison was a quiet, hard-working clockmaker who believed he had found the way. Re-reading this now, many of the details and events in the story remain as compelling as they were ten years ago. Longitude is a tremendous tale of battling scientists and the perseverance of hard work, brilliance, and humility through political intrigue and greed. Would I teach it? Not in an English class, but I'd refer to it as a great example of science writing. Lasting Impression: This book keeps a wonderful balance between the personal, scientific, and political elements of the story. It's history you can escape into. On October 22, 1707 four English warships crashed into the rocks of the Scilly Isles southwest of England. They quickly sank killing 2,000 men. The cause of this catastrophe was the inability to determine longitude, a problem that beset mariners everywhere. In 1714 the British Parliament set a £20,000 reward for whoever could solve the problem. The Board of Longitude, which would be primarily comprised of astronomers, was set up to award the money. To win the full prize, the method or device had On October 22, 1707 four English warships crashed into the rocks of the Scilly Isles southwest of England. They quickly sank killing 2,000 men. The cause of this catastrophe was the inability to determine longitude, a problem that beset mariners everywhere. In 1714 the British Parliament set a £20,000 reward for whoever could solve the problem. The Board of Longitude, which would be primarily comprised of astronomers, was set up to award the money. To win the full prize, the method or device had to be accurate to within one-half degree on a trip from England to the West Indies. There had been many ideas about how to determine longitude, but none worked reliably. They fell into two basic camps: the astronomical and the clock. The idea behind astronomy was to find a pattern of stars, the track of the moon or even the eclipses of the four known moons of Jupiter that would yield longitude. The clock idea was based on time difference. 15 degrees of longitude equals an hour. So a clock that could keep accurate time set to London time could be compared with a clock set to local time. The local time could be determined by sighting the sun at noon. The time difference would give the degrees of longitude from London. But prior to the eighteenth century clocks didn’t work reliably in the rough environment of ships at sea, so the London clock would be off. In 1727, a self-educated village carpenter and clock maker, John Harrison, heard about the prize. In 1730 he had plans for a chronometer as mariner’s clocks of sufficient accuracy would later be called. He showed his plans to Edmund Halley of comet fame, a board member, who sent him to a prominent clockmaker and fellow Royal Society member who encouraged Harrison to build his clock. Five years later Harrison presented the clock to the board. He had been able to take it on a voyage to Lisbon where it proved its worth. Harrison’s clock was original, intricate and exquisitely crafted. The board was impressed but Harrison himself was not. He felt he could do better and took another five years to build a second chronometer. 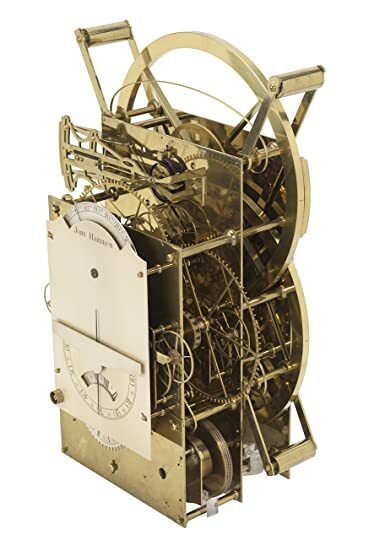 The Royal Society tested the second clock and gave it accolades but Harrison again decided he could do even better and took twenty years to build a third. 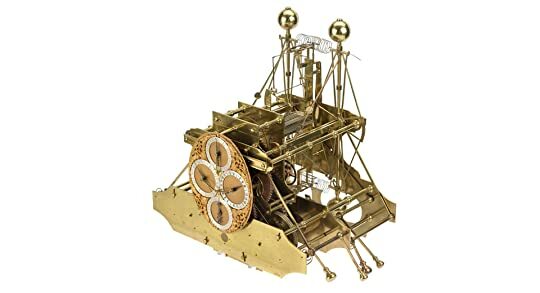 In the thirty years Harrison was building his three clocks astronomers were busily cataloging stars and navigational instruments were vastly improving. By 1760 the board was considering a complicated but effective method of calculating a ship’s longitude from the positions of the moon and stars. And since the board was mostly made up of astronomers, they instinctively preferred an astronomical solution to a simply mechanical one. Harrison was awarded the prestigious Copley Gold Medal in 1749 at the recommendation of the Royal Society for the many innovations he had made in his clocks that made them so accurate and reliable. But as usual Harrison himself was the hardest to satisfy. Immediately after completing clock three he built a fourth, a pocket watch that ultimately would win the coveted prize. On a West Indies trip the pocket chronometer worked perfectly, but the astronomers on the board dawdled about awarding the prize since they were now enamored with an astronomical solution. Since presenting his first chronometer, Harrison had been receiving stipends so that his work could continue, but the prize was elusive. Harrison felt his chief nemesis was Astronomer Royal, Nevil Maskelyne, a strong advocate of the astronomical method. Maskelyne took it upon himself to conduct further tests on Harrison’s watch. Finally in 1765 the board awarded Harrison £10,000, half the prize, and ordered him to make two more of the watches to show it could be duplicated. 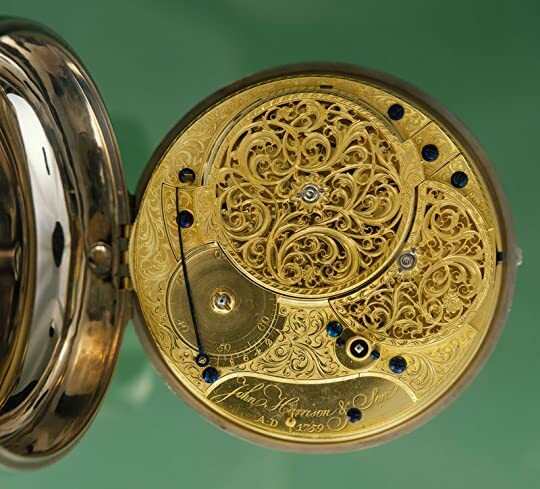 The board also commissioned another clockmaker to build an identical twin of Harrison’s watch. The twin was selected to accompany Captain Cook on his second voyage around the world. The chronometer won high praise from Cook who used it to make accurate maps. Finally through the intervention of King George III, Harrison received a final £8,750 in 1773. One of the biggest problems with Harrison’s chronometer was the cost, at least £400 to duplicate when a sextant and tables cost £20. But fifteen years later the price would drop to £80 and would keep declining. By 1815 over 5,000 chronometers were in service. The problem of longitude had been solved. Really lovely and very interesting reading. Everybody knows about longitude but I guess not so many know the struggles and fights behind the tries to 'conquer' it, including myself. (http://prints.rmg.co.uk/ Really lovely and very interesting reading. Everybody knows about longitude but I guess not so many know the struggles and fights behind the tries to 'conquer' it, including myself. The book is written on everyone's understanding, full of new historical facts (for me). It was a pleasure and it takes just a few hours to get it done; totally worthy of your time. This review has been hidden because it contains spoilers. To view it, click here. This book was intended for the general reader. Consequently it did not deal much with the details either of the astronomical or mechanical approaches to solving the problem of finding longitude on the high seas. Instead it focused on description of John Harrison's quest to build an ocean chronometer. The author treats the difficulties Harrison encountered convincing the Board of Longitude of the efficacy of his devices as a matter of petty politics and egotism without offering the reader suffici This book was intended for the general reader. Consequently it did not deal much with the details either of the astronomical or mechanical approaches to solving the problem of finding longitude on the high seas. Instead it focused on description of John Harrison's quest to build an ocean chronometer. The author treats the difficulties Harrison encountered convincing the Board of Longitude of the efficacy of his devices as a matter of petty politics and egotism without offering the reader sufficient detail about the technical disputes to make any judgments about the scientific debate at the center of the controversy. La Historia está llena de pequeños descubrimientos capaces de cambiar el mundo. Aunque debería decir pequeños vistos desde nuestros días. Este es el caso de la longitud, es decir, esas líneas imaginarias que trazan nuestro planeta desde los polos, dividiéndolo en veinticuatro partes iguales. La longitud era fundamental en tierra firme para trazar mapas lo más exactos posibles, pero sobre todo era esencial para la navegación. El mundo era un gran desconocido cuyos horizontes estaban todavía por d La Historia está llena de pequeños descubrimientos capaces de cambiar el mundo. Aunque debería decir pequeños vistos desde nuestros días. Este es el caso de la longitud, es decir, esas líneas imaginarias que trazan nuestro planeta desde los polos, dividiéndolo en veinticuatro partes iguales. La longitud era fundamental en tierra firme para trazar mapas lo más exactos posibles, pero sobre todo era esencial para la navegación. El mundo era un gran desconocido cuyos horizontes estaban todavía por descubrir y el único medio para hacerlo era en barco, surcando esos océanos y mares ignotos donde cualquier error de cálculo podía suponer perderse en su inmensidad y morir con seguridad, ya sea por la escasez de agua potable y alimentos como por escorbuto. Un barco podía pensar que estaba arribando a su destino cuando quizás era todo lo contrario, o podía colisionar con elementos desconocidos provocando su hundimiento. Hay que pensar en la longitud como un elemento asociado al tiempo. Si tenemos en cuenta que circunvalar la Tierra supone 360º, que se dividen en 24 meridianos de longitud, obtenemos una separación entre ellos de 15º, calculándose cada grado en minutos. Por lo tanto es fundamental saber en todo momento el tiempo real tanto en el barco como en el lugar desde el que se ha partido o el de destino. Parece simple, con un simple reloj arreglado. Pero no es tan fácil como parece, porque la temperatura y la presión atmosférica afectan mucho la maquinaria de los relojes, adelantándolos o retrasándolos o simplemente parándolos. El capitán pensaba que estaba a X minutos de su destino y se encontraba con que el tiempo pasaba y no arribaban a lugar alguno. Y aquí entraban en juego los partidarios de los relojes y los que preferían guiarse por el mapa estelar, mirando el cielo. Era tan importante para los países encontrar una solución al problema de la longitud, que les hacía perder barcos, mercancías, hombres y dinero, que decidieron poner una recompensa a aquél que diese una solución lo más exacta posible. El gobierno inglés llegó a ofrecer 20.000 libras, el equivalente a varios millones en la actualidad, estableciéndose así el Decreto de la Longitud de 1714. Muchos científicos de renombre hicieron frente al reto pero sólo uno lo consiguió, John Harrison. Esta es su historia, la de él y la de otros tantos que quisieron encontrar una solución al problema. Galileo, Newton, Huygens y un largo etcétera no fueron capaces que dar con la clave. Tuvo que llegar Harrison, un desconocido, un autodidacta aficionado a los relojes, carpintero de profesión para poner fin al problema. Y no lo tuvo nada fácil, porque además de intentar construir sus máquinas de precisión, tuvo que hacer frente a la oposición de los astrónomos, empeñados en que su método era el mejor y más adecuado. In Longitude, Dava Sobel chronicles the world's quest to tame time. In 1714, the English Parliament passed the longitude act. It established the Board of Longitude and offered a prize of 20,000 pounds to anyone who could find a simple and practical method for the precise determination of a ship's longitude. In particular Sobel highlights John Harrison's pursuit of the prize. She traces the arc of his career, and details the innovations of each of his subsequent entries (H1-H5) Unfortunately, eve In Longitude, Dava Sobel chronicles the world's quest to tame time. In 1714, the English Parliament passed the longitude act. It established the Board of Longitude and offered a prize of 20,000 pounds to anyone who could find a simple and practical method for the precise determination of a ship's longitude. In particular Sobel highlights John Harrison's pursuit of the prize. She traces the arc of his career, and details the innovations of each of his subsequent entries (H1-H5) Unfortunately, even though his Chronometers repeatedly proved their worth in Sea trial after sea trial, and the watch quickly gained adherents among sea captains, Harrison was thwarted at every turn in his attempt to claim the prize. Jealous rivals on the board used their influence to change the rules of the contest multiple times. His relations with the board became so acrimonious that eventually his friends went over the board's head and appealed directly to the King himself. George III asked that a special act of Parliament be passed and Harrison finally received his prize. Despite it's brevity, Longitude is an incredibly engaging and educational book. Sobel writes in a way that makes the science and math accessible to the general reader. An amazing book following the attempts to solve the longitudinal navigation problems. The author’s research covered several hundred years of partial success and many failures. Especially interesting was the English contest for solving the problem. An amazing man, John Harrison, worked tirelessly to conquer the problem. The trials of Harrison, and the jealously of others in his attempts made for a good story.. This genius is credited with producing the first marine machine to accurately calculate An amazing book following the attempts to solve the longitudinal navigation problems. The author’s research covered several hundred years of partial success and many failures. Especially interesting was the English contest for solving the problem. An amazing man, John Harrison, worked tirelessly to conquer the problem. The trials of Harrison, and the jealously of others in his attempts made for a good story.. This genius is credited with producing the first marine machine to accurately calculate longitude. Then he reduced his machine to a marine watch. He made numerous chronometers and many of them may be seen in the Royal Observatory and other places in England. I read this historical and biographical account in one evening. It's not without flaws, but I was fascinated and gave it 5 stars for holding my attention in a topic I rarely read about, where science, math, politics, and culture intersect with astronomical and nautical history. The technical details may be insufficient for some readers, but there was just enough for me. Author Dava Sobel caught my interest and held it. Kudos to her! Anyway....Naval ships were crashing against rocks and smashing to bits, off course because finding longitude was rather a guessing game, even though latitude was fairly straightforward. Skippers didn't know how far north or south of their latitudinal orientation they had sailed. They'd run aground in the dark, the fog, etc. So.... In 1714, King George and Parliament earmarked a HUGE reward (£20,000 pounds!) for whoever was first to come up with a highly reliable way to find longitudinal orientation. Solving the longitude problem became a national pastime, for decades. All kinds of quacks tried all sorts of crackpot methods. Funny funny stuff!! Sensible seamen, scientists, astronomers, and mathematicians also joined the race. However, it was a lowly clockmaker who came up with the best method. An enduring method. It became his life's work. I was reminded of this book today because in was on the PageADay Book Lover's Calendar for 3-31-2015. I read it back in the year 2000(+-). I have favorable recollections of the book, and I found it to be in interesting story. The following short review is copied from the calendar. Anyone with an interest in history or things maritime should consider Longitude," said USA Today of this bestseller. Sobel describes 18th-century clockmaker John Harrison's struggle to invent an accurate chronometer, wh I was reminded of this book today because in was on the PageADay Book Lover's Calendar for 3-31-2015. I read it back in the year 2000(+-). I have favorable recollections of the book, and I found it to be in interesting story. The following short review is copied from the calendar. Anyone with an interest in history or things maritime should consider Longitude," said USA Today of this bestseller. Sobel describes 18th-century clockmaker John Harrison's struggle to invent an accurate chronometer, which measured time, necessary to calculate longitude while at sea. Requiring decades of painstaking research, Harrison finally accomplished his goal, but then faded into the mists of time until his reputation was revived by Sobel's book, which is full of little-known facts about science, ships, and England in the 1700s. I take GPS for granted. I don’t use it that much personally, because I don’t tend to go anywhere, but I’m sure all this technology I love to use makes use of GPS. Thanks to GPS, we can forget that calculating longitude without the help of a network of satellites is difficult and requires great mathematical and engineering expertise. GPS might not be great at giving directions, but that doesn’t mean you’re lost. In the days—centuries—prior to GPS, you could get lost. Really lost. I’m not sure how I take GPS for granted. I don’t use it that much personally, because I don’t tend to go anywhere, but I’m sure all this technology I love to use makes use of GPS. Thanks to GPS, we can forget that calculating longitude without the help of a network of satellites is difficult and requires great mathematical and engineering expertise. GPS might not be great at giving directions, but that doesn’t mean you’re lost. In the days—centuries—prior to GPS, you could get lost. Really lost. I’m not sure how to describe how lost you could be, out there on the ocean, no longer in sight of shore. Latitude was relatively easy—well, easy enough once you dealt with the pitching deck, the storms, and the scurvy. Latitude corresponds both to the sun’s altitude in the sky (at noon) and to the altitude of certain stars (if you are in the Northern Hemisphere, Polaris is a good choice) at night. So you could figure out how far away from the equator or the poles. But how far away were you from the nearest charted island? And were you to the east of it, or the west? Longitude, or rather the “starting point” for lines of longitude, is entirely arbitrary. The only way to calculate longitude is to measure the difference in time between two points: the reference point (e.g., 0° longitude) and your current location. That sounds easy enough: just take a watch with you that’s set to London time, and at noon at your current location, check what time the watch reports. Much like our skill at flinging sophisticated pieces of technology into orbit has advanced, so too has our ability to construct watches. For the longest time, the solution to calculating longitude eluded mariners because no one could construct a clock that was both accurate enough and durable enough. The constant changes in pressure, humidity, and temperature played havoc with the fine mechanisms that allowed clocks to keep time. Without accuracy, a watch is useless as a method to calculate longitude. This problem consumed great minds for centuries. It eventually came to a head in 1714, when the English Parliament authorized the creation of a Board of Longitude to disperse prizes for new ways of accurately calculating longitude. The grand prize was £20,000—or $12 million in today’s currency. Longitude was a big deal. 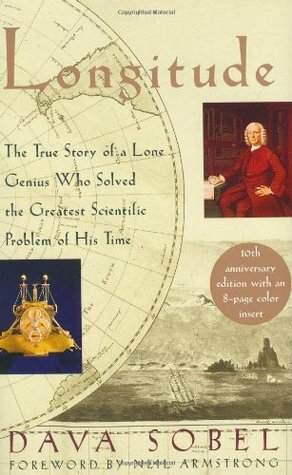 I knew the gist of the John Harrison story prior to reading Longitude, but Dava Sobel goes beyond the accomplishments of this single man and charts the course of the problem, and all its proposed solutions. She sets up a context against which the true scope and power of Harrison’s achievement might be measured. As I explained above, the general solution to calculating longitude was long in evidence, but no one could think of a way to effect it. Galileo had some good ideas related to his observations of Jupiter’s moon, but they were hardly practical for marine navigation. Later, Newton and other English scientists were convinced that astronomy held the key to calculating longitude—and the king agreed with them, establishing the Royal Observatory for the purpose of cataloguing the stars. More than a simple puzzle that made academics scratch their heads, the problem of longitude affected society and the economy. It drove scientific inquiry and technological innovation. Watching this unfold through Sobel’s storytelling is breathtaking and inspiring. Harrison’s origins read like something out of a fairy tale or a superhero book. His father was a carpenter, and he was trained as a carpenter, not as a watchmaker. Yet this craft fascinated him, so he trained himself to build clocks. In fact, he built a clock entirely out of wood, a clock that required no lubrication owing to the way he had constructed it and the type of wood he had used. John Harrison was not just a tinker or dabbler; he was a creative genius. So he decided to solve the longitude problem. And he did. But when he went to London for his reward, he was met with scepticism, animosity, and belligerence. Thanks to the politics of London, the Board of Longitude was populated by representatives from the astronomy camp, and they were none too keen on Harrison’s mechanical marvel. For the rest of his life, Harrison would improve upon his prototype and receive stipends from the Board, but that recognition and prize money lay beyond his reach. I personally think we tend to put too much stock in the “great individual” approach to history. I can see why it is appealing for stories, and for works of popular history: our ability to turn history into a biography boils away our dislike of dates and dry facts and lets us focus on the relationships and motivations of the characters. The central conflict of Longitude is not the need to calculate longitude but the antagonistic relationship between the Harrisons and the Reverend Maskelyne. Maskelyne championed the “lunar distance” method of calculating longitude. It just so happened, too, that later on in his life he became the Astronomer Royal, and therefore a member of the Board of Longitude. That didn’t go over well for Harrison’s chances at being awarded that prize. Indeed, echoes of the great rivalries across the ages surface in Longitude, reminding us that science is never as simple nor as objective as we like to think. Invention is partly innovation, partly inspiration, and part imitation. Sobel is careful to stress that Maskelyne was not the villain in this piece, merely the antagonist—like the feud between Newton and Hooke, the feud between Harrison and Maskelyne was a dispute between two men who knew their stuff. But where ego is concerned and establishing primacy is often necessary for the money and prestige that follows a discovery, tempers will flare and harsh words will be exchanged. So with this centuries-old problem juxtaposed against a feud between a rural carpenter-turned-watchmaker and the Astronomer Royal, Sobel turns Longitude from a history book into an exciting story. The trick to making any historical account interesting lies in exposing the details and connections that a casual reader, like myself, wouldn’t necessarily know. Sobel does this by charting the connections between Harrison and luminary contemporaries, including Isaac Newton, Edmund Halley, and Christopher Wren. She does this even with the considerable handicap of lacking much evidence about Harrison’s early life. Sobel also goes into the intricate inner workings of Harrison’s successive marine chronometers. The genesis and evolution of the marine chronometer, particularly once it had spread to other watchmakers, gave us not only an accurate way to calculate longitude but other useful horological innovations! As Sobel describes the clever devices he designed to solve the limitations of sea clocks, all I could think was, “I have no idea what she is trying to say. This book could use pictures.” Lo and behold, as I reached the middle of the volume, I stumbled into the glossy inset that includes diagrams of a grasshopper escapement and photos of Harrison’s portrait and the chronometers H–1 through H–4. It’s amazing that these timekeepers (with the exception of H–4) continue to run today. I wish Longitude were longer, but at the same time I love the size of the book as it is. My edition is a nice little paperback copy with a beautiful, high-quality cover. It is compact and deceptively slim for such an interesting history. Yet it is also definitely just a survey. I’m not sure, given the lack of details, how much longer Sobel could have spun it out. But the episodic nature of the chapters, and the abbreviated way she communicates the stories of the testing of H–3, H–4, etc., by Captain Cook and others, seems to indicate that there is more here to tell. Or is that another story? Oh well. I really liked Longitude. It has the perfect mix of narrative, character, and scientific explanation to make it a fascinating work of history of science. Dava Sobel weaves a fascinating tale set against a problem centuries in the solving, one that vexed astronomers, clockmakers, and mariners alike but whose solution led to advances in all three fields. I, personally, rely on my GPS devices to find my longitude. But it’s good to know that if the GPS network ever goes down, there is at least one museum I can rob for some high-quality longitude calculation devices. Now excuse me while I draw up some blueprints…. Interesting review of the tale toward discovering a correct way to measure longitude for a ship at sea. It's short and informative but actually quite on the dry side. Not told in a fictionalized sense at all, but more a recital of fact, placements, and progression. The clock maker who succeeded with that bio-metal strip that did not alter the time by expansion or shrinking of the components became part of the key. As most innovation of great magnitude, it was a self-appointed task, completely by Interesting review of the tale toward discovering a correct way to measure longitude for a ship at sea. It's short and informative but actually quite on the dry side. Not told in a fictionalized sense at all, but more a recital of fact, placements, and progression. The clock maker who succeeded with that bio-metal strip that did not alter the time by expansion or shrinking of the components became part of the key. As most innovation of great magnitude, it was a self-appointed task, completely by an individual. As far as popular science writing, or popular history of science writing (take your pick) goes, I've read better books. This is a book about a self-taught village clock-maker who created a whole new breed of amazingly precise chronometers, which enable the accurate measurement of longitude, and the fight he had with astronomers to get his solution recognised (and rewarded). High stakes (both in terms of the potential benefits to be had from being able to use longitude, and in terms of the reward As far as popular science writing, or popular history of science writing (take your pick) goes, I've read better books. This is a book about a self-taught village clock-maker who created a whole new breed of amazingly precise chronometers, which enable the accurate measurement of longitude, and the fight he had with astronomers to get his solution recognised (and rewarded). High stakes (both in terms of the potential benefits to be had from being able to use longitude, and in terms of the reward value placed on finding a solution), but while the author keeps on reminding us that it's very important, and telling us that his struggles with the politics of the board who were supposed to award the reward were very severe, I generally felt underwhelmed by the story, or maybe the way it was being told and structured. After starting off very dramatically, (at one point even blaming the problems of scurvy on the inability to find longitude), the early part of the story of John Harrison (the clock-maker) seemed pretty bland and lacking in tension. When tension did arrive later on (basically after he'd already solved the problem), everything got kind of rushed through - it is a very short book, and it might have been better with a little more time devoted to rounding out some of the ideas, so that diversions into a brief recap of Captain Cook's death, or the voyage of the Beagle actually felt like they belonged, rather than being shoehorned in for some broader appeal. All in all, I ended up feeling like Sobel had manufactured a bunch of tension and drama, but not actually delivered on filling in the colour and texture of it all. He was one of just two survivors who washed ashore, after their fleet hit the rocks of Scilly and more than two thousand men went to their watery graves in just minutes. He was barely conscious but alive. He was Sir Clowdisley, the admiral of the tragic fleet, and he had mistakenly steered his ships to disaster. One of his sailors tried to call attention to the upcoming catastrophe...but was immediately hanged. Inferior seamen were not allowed to keep their own calculations of maritime reckoning He was one of just two survivors who washed ashore, after their fleet hit the rocks of Scilly and more than two thousand men went to their watery graves in just minutes. He was barely conscious but alive. He was Sir Clowdisley, the admiral of the tragic fleet, and he had mistakenly steered his ships to disaster. One of his sailors tried to call attention to the upcoming catastrophe...but was immediately hanged. Inferior seamen were not allowed to keep their own calculations of maritime reckoning, not in 1707. Karma had the last laugh, as the Admiral went to his own reckoning. A beachcomber found the bedraggled officer...and immediately murdered him for the ring on his finger. So begins this book's quest to tell the story of the desperate need to solve the problem of finding longitude while at sea. One group of scientists believed the moon and the stars held the secret, while another group focused on clocks. John Harrison was the nondescript genius who found the answer, but then had to spend the rest of his years fighting the establishment to get the recognition and the reward. This book ended much too quickly. It's a bit of a whirlwind through the entire period, and I really wished for more background on each character. But, a good ride is a good ride. Amazingly, Harrison's first three clocks continue to tick centuries later, which is quite an achievement. Were he alive today, he would surely be part of the Google workplace. I'm not quite sure how to classify this book - history, biography, scientific treatise. But I found it intriguing and educational. It had never occurred to me how different latitude and longitude are. Since ancient times, seafarers had understood how to measure latitude (concentric circles parallel to the equator) based on the angle of the sun and the time of year. But longitude (circles which intersect at each pole - used to measure east/west distance) is much more of a challenge. Determining a I'm not quite sure how to classify this book - history, biography, scientific treatise. But I found it intriguing and educational. It had never occurred to me how different latitude and longitude are. Since ancient times, seafarers had understood how to measure latitude (concentric circles parallel to the equator) based on the angle of the sun and the time of year. But longitude (circles which intersect at each pole - used to measure east/west distance) is much more of a challenge. Determining a position requires much more sophisticated astronomical measurement and calculation. Or, it requires very accurate measurement of time. This little book tells the story of how inventors attempted to solve the vexing problem of obtaining a critical part in calculating longitude -- having a reliable timepiece providing accurate, standardized time on the sea. It's a surprisingly exciting tale: there was a contest, a rich reward and a deadline for entries. Before this problem was solved, sailors could calculate latitude by the stars but longitude required consistent, reliable timekeeping in all ocean conditions from one fixed point. This little book tells the story of how inventors attempted to solve the vexing problem of obtaining a critical part in calculating longitude -- having a reliable timepiece providing accurate, standardized time on the sea. It's a surprisingly exciting tale: there was a contest, a rich reward and a deadline for entries. Before this problem was solved, sailors could calculate latitude by the stars but longitude required consistent, reliable timekeeping in all ocean conditions from one fixed point. not the best quality, TBH! Enter J Finding the latitude in the 17th century was straightforward, but finding the longitude was extremely difficult. This compromised the safety of all seafarers, and in one particular incident around 200 lives were lost of the Isles of Scilly. A great little read - I was inspired to read this one after being lucky enough to see the longitude exhibit and the Harrison clocks at the Greenwich Observatory a couple of years ago (only just got around to reading the book). It's a great story and very well told - I mistakenly thought this was going to be a dramatisation / fictionalisation of the story - but it's not, it sticks purely to the historical facts. Very well written and constructed - for anyone with even the vaguest of interest in the A great little read - I was inspired to read this one after being lucky enough to see the longitude exhibit and the Harrison clocks at the Greenwich Observatory a couple of years ago (only just got around to reading the book). Time is to clock as mind is to brain. The clock or watch somehow contains the time. And yet time refuses to be bottled up like a genie stuffed in a lamp. Whether it flows as sand or turns on wheels within wheels, time escapes irretrievably, while we watch. If you read Bryson's A Short History of Nearly Everything, and are eager for more, Longitude will be right up your alley. (I've read so many "history of science" type books, I'm thinking I should create a GR shelf just for them.) A lot of the stars of History make an appearance, including Galileo, Cassini, Newton, Huygens, Hooke, Halley, and Euler. I read this as a biography of John Harrison, watch-maker and longitude measurer, but that doesn't start until chapter 7, a fulll 33% into the book. The most accurate description is that this is a micro history of the development of time-keeping instruments that allowed seamen to measure longitude accurately. If that sounds kind of dry, well, it is. This is interesting, well-written, readable, and brief, but it's not exactly scintillating. This tale is a fine example of how beauraucratic red tape is no modern invention, if anything it was even worse back in the early 1700s! I learned one shocking factoid: keeping track of your location on the ocean was a hanging offense! ...on that foggy night of October 22, 1707, the Scillies became unmarked tombstones for almost two thousand of Sir Clowdisley’s troops. The flagship, the Association, struck first. She sank within minutes, drowning all hands. Before the rest of the vessels could react to the obvious danger, two more ships, the Eagle and the Romney, pricked themselves on the rocks and went down like stones. In all, four of the five warships were lost. Only two men washed ashore alive. One of them was Sir Clowdisley himself, who may have watched the fifty-seven years of his life flash before his eyes as the waves carried him home. Certainly he had time to reflect on the events of the previous twenty-four hours, when he made what must have been the worst mistake in judgment of his naval career. He had been approached by a sailor, a member of the Association’s crew, who claimed to have kept his own reckoning of the fleet’s location during the whole cloudy passage. Such subversive navigation by an inferior was forbidden in the Royal Navy, as the unnamed seaman well knew. However, the danger appeared so enormous, by his calculations, that he risked his neck to make his concerns known to the officers. Admiral Shovell had the man hanged for mutiny on the spot. This little book is a gem. Less than 200 pages but a fascinating story. It is almost unfathomable in this age when it seems that practically everyone has a GPS device in their car, an iPhone, and a personal computer that there was a time when if you set sail you depended on luck or the grace of God to arrive at your destination once you were out of sight of land. All the explorers of the age, Babloa; Magellan; Drake, "all got where they were going willy-nilly". In the 18th century "the wealth of This little book is a gem. Less than 200 pages but a fascinating story. It is almost unfathomable in this age when it seems that practically everyone has a GPS device in their car, an iPhone, and a personal computer that there was a time when if you set sail you depended on luck or the grace of God to arrive at your destination once you were out of sight of land. All the explorers of the age, Babloa; Magellan; Drake, "all got where they were going willy-nilly". In the 18th century "the wealth of nations floated upon the oceans". No ship had a reliable means of establishing her precise location. As a result an unknown number of ships and sailors were lost. It became a great quest to discover a solution to the longitude problem. It would be on par to trying to discover the cure for cancer today. Nations offered huge purses for a solution. Notable among these was the British Parliament's Longitude Act of 1714 naming a prize of several million dollars in today's currency. Such prizes brought out the crackpots but there were basically two different legitimate schools of thought towards a solution. On the one side were the astronomers. On the other side were the horologists. The clockmakers. Among the later was John Harrison. Harrison had no formal education or apprenticeship. There is a story that as a child he came down with smallpox and was given a watch to amuse himself while recovering. There is some dispute on this as at that time a watch was both rare and expensive. None the less Harrison became a self taught clockmaker. He was a craftsman and an innovator. Harrison's efforts in solving the longitude problem gave us the chronometer. He built four different clocks in his quest to solve the longitude problem all the while some of the worlds leading astronomers, including Edmund Halley, were mapping the stars in their effort to solve the problem. I am not sure how many people know about this chapter in our history. It is a story of navigation, astronomy, and clockmaking. Some people really geek out on the history of science and innovation, especially that magical era at the dawn of the age of reason and the industrial revolution. I'm that sort of geek, so this book was just perfect for me. The longitude problem was one of the biggest scientific problems facing humanity in the early 1700s. The British government posted a large reward — the equivalent of millions of dollars. The Longitude prize was a forerunner to modern innovation prizes like the X Prize for launc Some people really geek out on the history of science and innovation, especially that magical era at the dawn of the age of reason and the industrial revolution. I'm that sort of geek, so this book was just perfect for me. The longitude problem was one of the biggest scientific problems facing humanity in the early 1700s. The British government posted a large reward — the equivalent of millions of dollars. The Longitude prize was a forerunner to modern innovation prizes like the X Prize for launching a manned spacecraft into orbit, and the Orteig prize for a direct flight across the Atlantic (won by Charles Lindbergh). Longitude and latitude are coordinates for naming a location on the globe. Latitude identifies North-South position (for example, Canada and Mexico are at different latitudes) while longitude identifies East-West position (for example, Japan and California are at different longitudes). Ships were traveling all over the globe by the 1600s, but they could only determine their latitude (by observing the stars) while at sea. Longitude was just a guess. So you'd have the clumsy situation of a fleet of ships traveling someplace and sailing back and forth along the latitude trying to find the island they were looking for. Unlucky guesses could result in many deaths. It's hard to imagine this today, but solving the longitude problem would be equivalent in modern times to landing on the moon or curing cancer. This book documents the half century that the one man who eventually solved it, and along the way he made horology (clock engineering) into an important and respected craft. His struggles are not just technical, but also political and personal. I liked the writing style (curt, it lets the drama of the events speak for themselves) and the chapters are a perfect bite-sized length. Sobel ranks right up there with Mark Kurlansky for writing detailed, fascinating accounts of historical technology. Calculating longitude had bedeviled mariners for centuries. To do so required an extremely accurate timepiece. John Harrison thought he could solve the problem. The book is a nice combination of science and biography. It reminded me of another similar work Noble Obsession Charles Goodyear, Thomas Hancock, and the Race to Unlock the Greatest Industrial Secret of the Nineteenth Centur Sobel ranks right up there with Mark Kurlansky for writing detailed, fascinating accounts of historical technology. Calculating longitude had bedeviled mariners for centuries. To do so required an extremely accurate timepiece. John Harrison thought he could solve the problem. The book is a nice combination of science and biography. It reminded me of another similar work Noble Obsession Charles Goodyear, Thomas Hancock, and the Race to Unlock the Greatest Industrial Secret of the Nineteenth Century which details Goodyear's lifelong attempts to discover the secrets of vulcanization. The search for an answer was given a push when Parliament offered a huge prize for anyone who could find a way to calculate longitude accurately. A big problem was figuring out a way to overcome errors induced by humidity causing the pendulum to swell or cold making it contract. Both these effects would through off its balance inducing time-keeping errors. Technical enough to satisfy those who want the details, lucid enough for the non-technical to comprehend the central problem and its attempted solutions, engaging enough to draw in all kinds of readers, this kind of book could get practically anyone excited about applied science through real-world problem solving. When my dad went to college back in 1958, my grandma spent a small fortune to buy a 17-jewel (or was it 11?) Swiss wrist watch for him. That thing will probably be off only a couple of minutes a year. A few years back, I gave him a different watch, a solar-powered so-called atomic watch which is really a quartz watch that can synchronize to real atomic clocks through broadcast towers on three (or was it 4) continents. Adjusted for inflation, this second watch is probably cheaper. The rate of tec When my dad went to college back in 1958, my grandma spent a small fortune to buy a 17-jewel (or was it 11?) Swiss wrist watch for him. That thing will probably be off only a couple of minutes a year. A few years back, I gave him a different watch, a solar-powered so-called atomic watch which is really a quartz watch that can synchronize to real atomic clocks through broadcast towers on three (or was it 4) continents. Adjusted for inflation, this second watch is probably cheaper. The rate of technological advancement is extraordinary over a long period of time because it's exponential. Backing off to the early part of the exponential function, you'd find glacier speeds of innovations (from today's perspective). But they are every bit as exciting and important. This book tells you the fascinating stories around the end of the 18th century when precision timekeeper was just about to be invented and chronometer was not a word yet. As they say, necessity is the mother of invention. The necessity this time was navigation -- or more specifically, longitudinal navigation. Determining latitude at sea is relatively easily as the season changes rather slowly and thus the sun stays at stable azimuth at noon. But longitude is an entirely different thing. You need to keep time accurately. Your watch and clock do not tell current time in some magical way, they track cumulative passage of time. Therefore, any small error accumulated over a long voyage can be substantial. So much so, back then the Royal Navy essentially was rather clueless as to where they are (longitudinally) at any particular moment. Yet, uncertainty and ignorance undermine authority and are therefore not allowed to be displayed. Thus any personnel keeping his private navigation on board is capital offense! One such officer risked his life to tell his commanding officer that he thought they are in grave danger. He was hanged for mutiny. The rest of the ship drowned (with two exceptions and one of which is an admiral who despited being washed ashore alive, was later murdered for his beautiful emerald ring -- history makes stories that rival Dumas's). Dava Sobel is an accomplished writer of popular expositions of scientific topics. A 1964 graduate of the Bronx High School of Science, Ms. Sobel attended Antioch College and the City College of New York before receiving her bachelor of arts degree from the State University of New York at Binghamton in 1969. She holds honorary doctor of letters degrees from the University of Bath, in England, and M Dava Sobel is an accomplished writer of popular expositions of scientific topics. A 1964 graduate of the Bronx High School of Science, Ms. Sobel attended Antioch College and the City College of New York before receiving her bachelor of arts degree from the State University of New York at Binghamton in 1969. She holds honorary doctor of letters degrees from the University of Bath, in England, and Middlebury College, Vermont, both awarded in 2002.